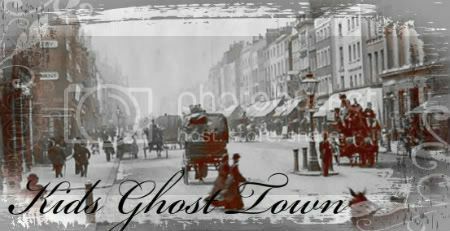 Welcome to the Ghost Town! Lost in the outskirts of London Engand, children of all ages, get lost, and are scavenging for food. A path appears to those who need it most. Bring no one, or you will face the greusome wrath of the Demonic Spitits, still kindling here, after the civil war of England, beginning in 1642. A worn, paved road where all main events go on. Ghost Town Farmers Market, protests if any. Main Street is where the magic path will lead. Where we come in the beginning, when you first get here. The place where we eat. Running water, electricity coming from the ghosts' presence. Where the demonic ghosts reside, in the attic. The library is filled with hundred of books. Feel free to add to the library. As you walk in, you have an eerie feeling as if you were unwanted. Go with an Angelic Spirit, and you will not have that feeling. An old church, complete with a cemetery and catacombs under the foundation. Where the Angelic Spirits reside. Optional religious all-denominational services happen. Where most spirits get their power from, since it is where most of thier bodies are. Old, dusty passagways that go all around under the ghost town. Bones and dead bodies are scattered around the floor. The area that all speeches, musicals, plays, operas, and anything involving the Arts takes place. Where all residents of Ghost Town will reside. Ghostly room service occasionally, if you are treating the Angelic Spirits properly. Has a pool, and three levels. There are two bed bedrooms, if you want to room with someone. Where we make all of our manufactured exports. There is a carpenters shop, forge, blacksmith, ect. Where we have clothes, food, and anything in general. There is a laundry machine in the back to wash clothes. Where you will bring your imports from London. A non-alcoholic bar. Beverages still on shelf. The bar has an old, some-what working bowling alley. Where parties are, mostly hosted. Where we will grow our exports. Many fields of: Cotton, vegetables, wheat, ect. You are allowed to bring your own seeds from London, as long as you share your keep. A bunch of houses, haunted and regular. Please PM Jayden or Mitchel if you want to stay in one of these. This a thick forest with tall, dark pine trees. There is a tiny path there that leads to the Agricultural Fields. The creek comes from an underground freshwater spring, and is a scource of water. Where we will sell our exports, every Saturday. Where some Ghost Children come from. There are alleys scattered all around London, so here is where you RP if you are in a random alley for some random reason. This is where the Ghost Kids may go to school, if they wish. It may be easier just to post here for studying or eating lunch, because we don't have any teachers.